Photogram is a bit outside the spectrum of things that we typically review at Family Friendly Gaming. 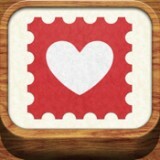 This iPhone app from Timelines, Inc. allows you to send quick photo messages to friends and family. Photogram makes it even easier for your great-aunt Bernice to send you photos of her cats. The graphical layout of Photogram is crisp and clean and the layout is very intuitive. The app includes several themes to apply to your messages to give them a distinct appearance. All of the included themes feature family friendly images and designs. Users can add up to 4 of their own pictures per message from their photo library stored on the iPhone or by taking new images with the iPhone camera. Each message sent with Photogram will shamelessly include a small add for itself at the bottom of the message. Photogram features no audio or music, nor does there seem to be a need for it to do so. As this is a messaging app and not a game, sounds would serve little purpose. That doesn’t leave much for me to comment on in this section, so I added this last line for filler. Photogram is free to download so you’ve got nothing to lose if this app appeals to you. You can send unlimited messages using the included themes and your friends don’t need any special software to receive the messages. Your Photograms will arrive directly to their inbox just like a normal e-mail. If you find yourself craving more themes, Photogram offers a “Theme Store” where you can purchase additional themes and even download a few freebies. The themes are apparently created by independent artists who will receive some of the proceeds from each purchase. Photogram is very simple to use. It’s definitely easier to quickly attach photos and send them out than the “traditional” way. Once you’ve added your photos to the message you can even optionally crop and zoom to get them the way you want before sending. Choose your theme, type a quick message, select the recipient/recipients and you’re done. If you’re so inclined you can even share your Photograms via Facebook and Twitter to keep all of your adoring fans in the loop. Virtually everything you do in Photogram is done from a single screen so there’s no cumbersome switching back and forth between screens. One thing I would like to see is a version of Photogram designed specifically for the iPad. While this version will work on the iPad, it’s obviously not designed to accommodate the larger screen. Photogram can be a great tool to keep in touch with friends and family. It creates a quick and simple way to send brief, decorative messages to those you care about. I found no offensive content during the time I spent with Photogram. I browsed through several of the themes available for purchase and they appear to be innocuous and free from offensive imagery. When you start receiving those cat pictures from Auntie Bernice, just remember you heard it here first.